In his first game against the Minnesota Vikings nine days ago in relief of the benched Stefen Wisniewski, Isaac Seumalo had a very bad opening series to start the game, and then kind of settled in and played much better the rest of the way. 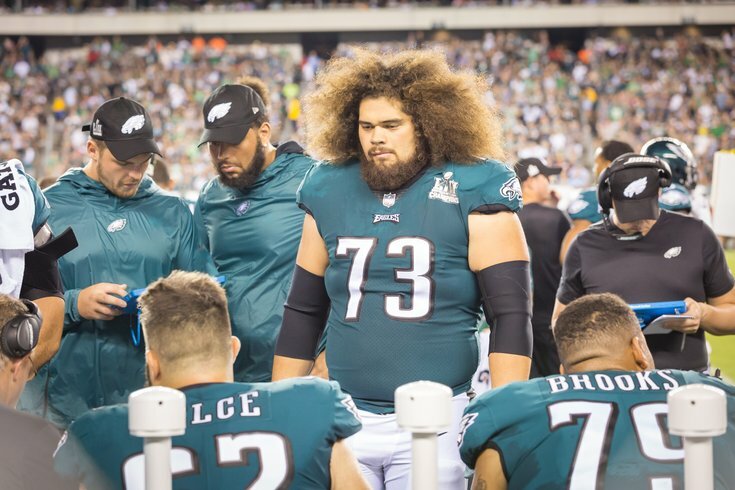 In his second game against the New York Giants on a short week, Seumalo had a very good game, initially starting at left guard, and then moving to right tackle for the fourth quarter after Lane Johnson tweaked his ankle. The Eagles did not attempt any deep drops when Seumalo was at RT, with a banged-up line and a big lead. It was mostly run plays, and some low-risk passes. In pass protection, Seumalo did not allow any sacks or quarterback hits on the night, and I had him down for a pair of pressures allowed. In the run game, Seumalo showed off his awareness, agility, and improved strength. Here is a video of some plays that stood out to me, good and bad. To note, we could also just show the times Seumalo provided good pass protection, but that would make for a pretty boring video, so you'll just have to trust me that he was mostly very good there Thursday night. "The biggest thing is his power and strength," OL coach Jeff Stoutland said when asked what the biggest difference was between Seumalo last year and this year. "He's extremely athletic. We all know that. The guy went out an played right tackle like it was nobody's business. That's never been an issue for him. It's been the power and the strength portion of it, and I think the people in our weight room have done an unbelievable job with him. That's where you notice a huge difference in him, in my opinion." When the Eagles benched Wisniewski for Seumalo, Wisniewski suggested that his demotion was not based on performance. Stoutland, however, emphatically defended the decision to make the switch. "I just know this," Stoutland explained. "I have an obligation here to Mr. Lurie and the organization here to make sure that we have the best five players on the field. That's my job, and I tell every player that coming in. This kind of thing happened last year, where (Wisniewski) ended up becoming the starting left guard. So as we go and as players develop, as players improve and get better, if they're sitting there and I know in my mind and I know in my heart that that's one of the best five players, then he needs to be on the field. So how did Stoutland come to that decision? "Just watching the practice sessions every day," he said. "I mean, I can't sit there and ignore something. I love all the players. Trust me, you don't even know how much I care about those guys. I tell them all, straight-up from Day 1, there's nobody here that's my cousin or brother-in-law. I say 'If you're the most productive player, you'll find a spot on the field.'" From a long-term perspective, there's little question that Seumalo possesses more upside than Wisniewski, because of his athleticism. However, Wisniewski hadn't played egregiously badly when he was benched, so questions about Seumalo replacing him were valid, from a short-term perspective. If Seumalo can build on his performance last Thursday night, those short-term concerns will fade away quickly.